Dale of Norway "Hemsdale" sweater is racing along. Yesterday was a nasty weather day with 12" of snow topped by sleet and freezing rain. Fortunately we snow blowed right ahead of the rain so didn't end up frozen in until June. Most of the day was spent knitting and watching old movies. I'm up to the back of the reindeer with about 60 more rows to go for the body. Sleeves are 3/4 done and length will be adjusted depending on how far the shoulders drop. It's been a fun knit but the Heilo is not as pleasing to the hand as the Shetland wools. It will be a warmer sweater though. 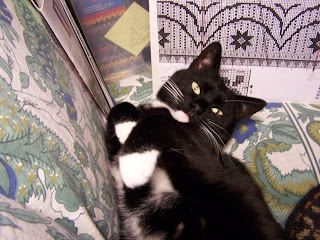 Miss Boots the Cat has blossomed since Patter passed away. She has become the constant companion that he was and has started to be very vocal. She snuggles in beside me when I'm knitting and doesn't chew through the yarn like he did. Fun cat. Wish I understood what she was talking about. I'm also knitting ten rows on the Sweaters from Camp "Shirt Tail Hemmed" sweater each time I sit to knit. Don't know why I'm having to force myself on this one other than it is sleeves and sleeves are not my favorite. The colors are so pretty and the pattern is exceptionally well written. Other thing I did yesterday was to get out most of my Aran books and patterns and go through them looking for a cardigan that called to me. I want to use Janet Szabo's book as a guide and design my own. So many beautiful cables out there and so far, I'm trying to get too many complicated ones in one sweater. This will be a long thinking project. Anne- Hemsdale is absolutely lovely. What a gorgeous design. I'm putting together an original aran, and the hard part was deciding which of the many cables I could live without. So one Aran became two. 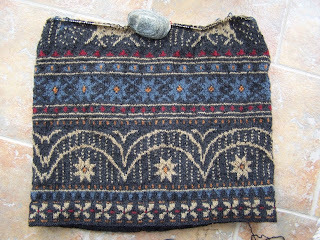 So many lovely knittings in different patterns .Found a link to your blog in aran knitting group on yahoo.